Dal Palak: Split Bengal Gram, Split Green Gram, Water, Spinach, Refined Sunflower Oil, Onion, Garlic, Ginger, Green Chilli, Cumin Powder, Coriander Powder, White Salt, Turmeric Powder, Red Chilli Powder, Fennel Powder, Kasuri Methi and Black Pepper Powder. 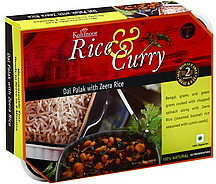 Zeera Rice: Water, Basmati Rice, Refined Sunflower Oil, Salt and Cumin Seeds. Allergen Advise: Manufactured in a facility that processes milk, nuts, sesame, mustard and soya products. Do not consume if the tray is leaking or bloated.